This past summer, the cafeteria was renovated to give it more room and make lunch time run more efficiently. The offices, previously next to the cafeteria, were moved across the commons and now occupy what was once an area for round tables and vending machines. 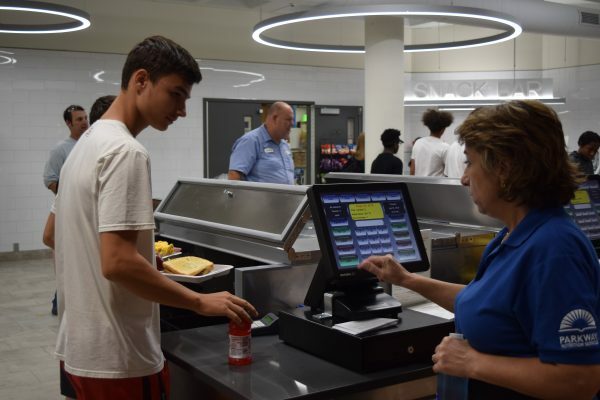 Senior Luis Schneegans buys lunch in the new cafeteria area. “I think they [the students] like it because there’s more room in here. They’re not fighting for position as much,” said Kikta. Reactions to the new additions have been mixed. Senior James Hanselman believes that the new cafeteria suffers from a congested line but appreciates how open the interior is. Cafeteria Entree Cook Paul Kikta, who has worked at North for 3 years, is pleased that the new equipment is easier to work with. 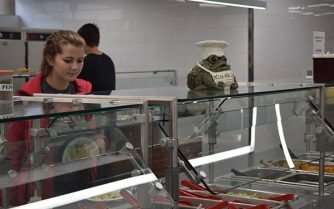 The changes to the cafeteria were done as a part of a renovation plan North began as part of a bond issue from 2014. The first phase of changes were seen last year when the fine arts wing underwent a complete reconstruction. “North is under a 10-year master building plan. They started renovations just after the 2014 bond issue, and in 2015 they started doing things in the infrastructure.” said Cain. The renovations were done primarily with the goal of providing more space for both students and staff. More changes are scheduled in the future, according to Cain. Along with completely new additions, some parts of the building will get redone. These changes are expected to start arriving in a couple years. Time will tell if even more are added as well.